Jeremy is a fan of many things; his wife Ashley, his two children Hattie and Jordie, being loved by Jesus, and music. Just to name a few. Jeremy is a musician who had plans on being a music producer, or at least an audio engineer, but somewhere along the way was bitten by the “radio bug”. After attending school at REC in 2003 he returned to his hometown of Huntington, West Virginia and began turning in resume’s anywhere he could apply and grow his talents in audio engineering. Clear Channel (WKEE) welcomed him in where over the next eight years he grew more and more in love with radio, music, and the possibility of a career. He could’ve never imagined what the next few years would bring. 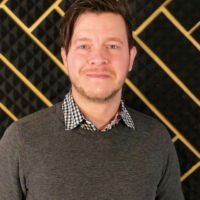 In November of 2011 a series of events would take Jeremy from a board-op and a Top 40 on-air talent to an opportunity to serve at a start-up network called Walk-fm. Through trial, error, risk, a healthy dose of self-permission to fail, and a bit of Divine “favor” Jeremy has not only seen the station grow, but himself as well. Today Walk-fm Radio serves the Huntington, WV area and surrounding communities with the Good News that people are loved no matter who they are or where they’ve been. Check out the Your Morning Walk page!